It seems like every year, the horror movie everyone talks about most is the one that set the bar high early on and was never topped. Last year, February's The VVitch held that position. The year before that, It Follows. It's pretty clear that this year's high bar is the (at of the time of writing this) 100%-fresh reviewed Get Out, Jordan Peele's directorial debut, which captures the horror of white supremacy in a society that largely pretends it's above it. Get Out starts with a Guess Who's Coming to Dinner setup: Chris (Daniel Kaluuya) is headed to his girlfriend Rose's (Allison Williams) home for the weekend to meet her parents for the first time. They've been dating for about five months, and Chris is nervous about the interaction - Rose, who is white, hasn't mentioned to her parents that Chris is black, and he's not sure they'll handle it the way Rose believes they will ("My dad would have voted for Obama a third time if he could have!" she protests). Despite warnings from his friend Rod (Lil Rel Howery), Chris decides to go. Chris's first night with Rose's family feature potentially well-meaning but racist interactions with a nervous white family attempting to show Chris they aren't racist. Rose's dad (Bradley Whitford) develops a penchant for adding "my man" to everything he says, and Rose's brother's attempts to talk about sports & athleticism are skin-crawlingly awkward and inappropriate. Peele succeeds at getting the viewer laughing and cringing, on guard for what's next (which includes an attempt to rid Chris of his smoking habit by literally hypnotizing him). The following day, Rose's family is preparing for a huge dinner party, and it's here things begin to shift in tone from Guess Who's Coming to Dinner to Stepford Wives. As his interactions with white people move from microaggressions to open hostility, Chris wonders whether he's reading too far into things or if he's actually in danger. And, well, because this is a horror film, obviously you know Chris isn't paranoid. 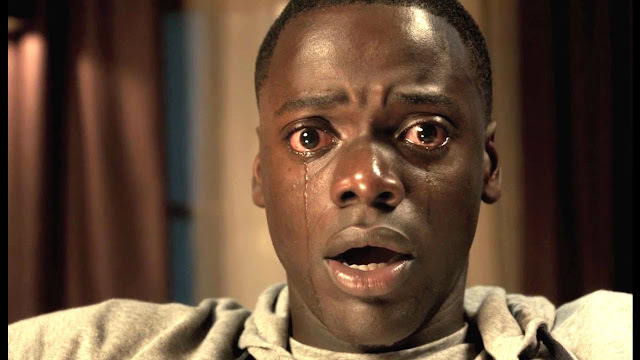 Get Out showcases the horror of racism not only in acts of physical violence, as you might expect from a film in this genre, but in the less obvious ways everyone can relate to, whether as the recipient or the perpetrator. In an interview, Peele said he created the concept when Obama was running for office and the country felt it had left racism behind: "It was almost like, if you talk about race, it will appear and we're past that now," he said. "With the emergence of Black Lives Matter and the discussion becoming focused on the police violence... this movie's purpose transformed into something that was meant to provide a hero and release from all the real horrors of the world." Kaluuya, of Black Mirror and Sicario, is the best performer in Get Out. His palpable discomfort and ability to quickly pivot from comedy to terrified horror protagonist are the core of this movie, because with only a few small exceptions, the whole film is shot from Kaluuya's point of view. It also seems unlikely the casting of Allison Williams, who is best known for her role on Girls, was coincidental. She's perfect for the part not only because of her acting (which is fine), but because of the immediate connotations she brings to that role as a result of her previous experience. Audiences are so used to the manufactured horror cues that try to elicit jumps or screams these days that true scares are often few and far between, but in Get Out I found myself lurching out of my seat on more than one occasion. Whether depicting the horror of being a black man in a sundown town or the counter-productive attempts of white people to prove they aren't racist, Get Out succeeds in evoking strong reactions from the audience from one moment to the next. It's one of the best directorial debuts I can remember and seems a likely start of a successful directorial career for Peele.